LEBEC is an acronym in sorts for Landscaping, Engineering and Building. In 2009, Bob and Edward decided to combine their expertise and knowledge, forming LEBEC, Inc. Bob Brockman and Edward Machado each owned their own construction businesses. Bob began working in the underground, foundation and engineering construction industry in 1977, forming his own business Brockman Engineering Contractors, Inc. (BEC) 1988. Bob has spoken at several conferences and seminars throughout California about the different problems and repairs for drainage and foundations and is considered an expert in his field. Edward began working at his father’s construction business in 1987, working at several different firms, becoming an expert in his field. 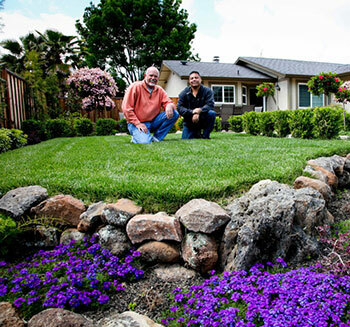 Edward opened his own landscaping, design, installation and construction business, Machado Landscape and Design in 2006. Edward has won several awards for his designs and GREEN installations. Combined they have over sixties years of experience and expertise. Family owned and operated from the beginning; at LEBEC, Inc. we take pride in our reputation to provide technical expertise, and our quality of workmanship, performed to the highest industry standards, minimizing both time and inconvenience to our clients. We will work with you from start to finish, building a lasting relationship. Ninety percent of our clients are on a referral basis, repeat clients and word of mouth; our best advertising is you! One of the unique aspects of LEBEC, Inc. is that we will take you shopping to ensure materials, colors and textures are exactly what you select. Tell us about your project and we'll get back to you right away! No Job is too big or too small, so let us know!